Ghonchu was the proud owner of a new smart phone. He walked proudly in his office cafeteria and strategically took the phone out of pocket in a place where there were more females around and pretended to type busily on it. On looking up, he realized nobody was paying any attention to him (or his phone); then he remembered; his company had gifted the same phone to everyone. Disappointed, Ghonchu kept the phone back in his pocket thinking that he couldn't catch anyone's attention (as usual) even with his new phone. However, while thinking of such thoughts, Ghonchu forgot that his pocket didn't usually hang (in thin air) outside his jeans, and dropped the phone with a loud 'clunk'. Twenty pair of eyes turned towards him with an expression of stunned disbelief. Ghonchu quickly picked his phone up (which thankfully suffered no damage) and walked away wondering what gave him the idea that his phone couldn't be used to catch attention (albeit not in the way he expected). Ghonchu went back to his desk and decided to show off his phone on the internet. He logged into facebook intending to publicize the fact he had a smart phone. However, on checking other friends' updates, he was thoroughly disgusted to realize that each and every company employee had already done the same. Facebook was flooded with posts from employees flaunting their new phones. Now, baffled Ghonchu racked his brains as to how he could show-off his new phone. Not being very techy by nature, he didn't know too many features of the phone which he could rave about. He decided to flaunt it in circles outside his company. He went to a restaurant outside with friends where he sat on the corner seat next to a table where some girls were sitting; took his phone out and kept it on the table. The adjacent table's nearest seated girl looked at his phone, completely ignored Ghonchu (no admiring glances or eyelashes); and continued chatting to her friends. Tired Ghonchu went back home and decided that phones are meant for only one thing and nothing else. To make/receive calls. Ghonchu kept his phone on a table and decided to go to bed. However the new phone had something better up its sleeve. Ghonchu, who didn't usually get many calls, got a call that night. It was from Sweetu. Startled, Ghonchu managed to drop the phone again; when he finally picked it up and talked to her, he could barely talk coherently. The reason for the call was a mundane one. Ghonchu slept that night clutching the phone close to himself and with happy dreams. "This is a lucky phone. On its first night, I got a call from Sweetu. So what if no one was impressed by it!" I fell in love with football on a wintry day in 2003 when I first got cable and started watching ESPN. At that time, for some health reasons I could barely walk, far less run or play football. It started as a dream; a standard teenager's dream of wanting to play, score goals to a rousing applause. That dream stayed for a long time, being nurtured and cherished everytime ESPN telecast football. Those early years of following football went by dreaming of outstanding tackles, stunning overhead kicks resulting in goals and playing in front of a large audience who would explode into rapturous ovation. Dreams have this beautiful nature of having absolutely nothing to do with conscious reality. Despite knowing all of the above to not be plausible, I never stopped dreaming. The years rolled by steadily; the early years of college going in making lame excuses to why I couldn't play any games and being laughed at. Years rolled on, by the final year of college I had made feeble and cautious attempts on trying out sports again, little bits of cricket, basketball etc but not football yet. Thou desires most what thee don't haveth. My craving for playing football only increased in all these years. That chance finally came in IISc when I felt confident enough to be able to challenge my body into playing. Five years after following football on TV like any average youngster, I finally was able to play it for the first time after school days. I still remember the thrill of kicking the football on that summer day in 2008. I felt like a winner on that day. My initial days in playing were more around finding more about what limits I could stretch to. As luck would have it, one of my first achievments while playing for those initial few months wasn't scoring beautiful goals or making outstanding tackles but to break my left hand in such a way that it needed surgery. Bang went my chances of playing for another few months by which time I had to graduate. However fates gave me another chance when I was fortunate enough to join a company with a sprawling campus and lovely lush green grounds. After now playing regularly and freely for the last one year, I felt I had achieved my dream. I couldn't have asked for more really. Last month, we had an intra-company soccer tournament. I can't sprint, would be wheezing after a couple of minutes of hard running; I am not a great dribbler or anything like that; I don't kick the ball the correct fashion because no one ever taught me how (those who 've seen me play know that); all the things I can't do on a football field could fill out a couple of pages. 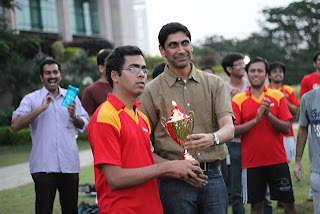 Yet on the evening the tournament ended, I looked into the mirror; and saw a broken toe, a bruised and battered body (a small price to pay), the captain of the runner's up team and the player of the tournament standing there. Not a bad achievment, considering I once doubted my ability to walk normally again. Indeed, dreams can be accomplished within the same lifetime if you try hard enough. 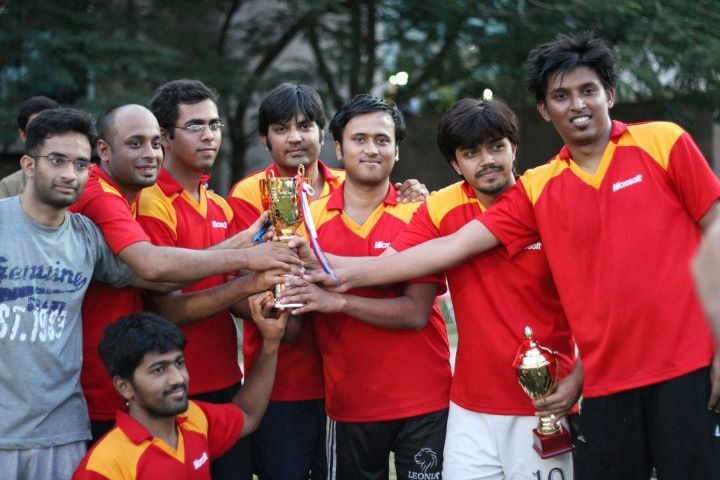 Our team lost in the finals (in extra time), but we were still magnificient throughout. I must take this opportunity to thank all those who believed in me, encouraged me to go out and play, and many of those who allowed me to play with them. A couple of photos after the tournament! Ghonchu stepped into the city of Hungryland with a look of awe. The cities of Europe were beautiful and Hungryland was no exception. He was impressed. However although Ghonchu was impressed, his stomach wasn’t. He hadn’t had much to eat since he had stepped onto his flight from India to Hungryland a few hours ago. His stomach which had rumbled politely earlier now voiced its displeasure more powerfully. Though it is the season of fasting in India, Ghonchu’s fasting ability extended to fasting from dinner to breakfast the next day. Ghonchu decided to look for food options. He could see multiple options nearby. He discarded some of them after concluding they would be too expensive. He chose to go to a dingy little place which sold burgers and sandwiches. “Aye, aye! Of course”, she replied happily having understood what Ghonchu wanted. Ghonchu mentally puked and kept back the sandwich. Ghonchu took the other one and quietly walked away. It tasted okay. PS: Ghonchu still doesn’t know whether what he ate was vegetarian or was the shopkeeper trying to avoid returning money to him, but he is happy with the fact that he ate whatever he bought thinking it was vegetarian. What does the above heading really mean? We crave so often for something from the bottom of our heart. Night and day, one might have had vision, that desire. It could be a moment or a period of time what one craves for. And one day that dream materializes! It might have happened unexpectedly or might have been achieved through a lot of hard work. Do we even realize that it has materialized. Does it really taste sweet then. Do we really appreciate it when we get it. Do we realize we 're now actually living our dream - this was something one longed for all this while. Do we maybe just sit back and enjoy whilst it lasts or do we've a tendency to start worrying about what next. Maybe we realize and understand better when the end of that dream is nigh. And how do we react when we realize that that dream is close to coming to an end. We sit up and begin to appreciate what we had. As we look back, we see that it was a beautiful time; a wonderful dream that is now coming to an end. We remember those times when we craved for that dream; and the sheer delight that filled one's heart when that dream materialized. What else does one feel when the walls begin to close in, the dream begins to fade. Feel satisfied at having lived one's dream! Or remember those earlier times with a sense of pathos! Or be pragmatic and just forget about it! Or develop new dreams and look forward to them! Or write such rambling articles! Education and its uselessness ..
Last Sunday, the AIEEE exam took place. It has been taking place for the last nine years or so. However this time there was a glitch. The exam paper got leaked. As a result, the authorities had to take some drastic measures, cancel that version of the exam paper, postpone the exam by 4-5 hours. Observed recently at my "highly-esteemed" company! At the cafeteria, you gets idlis and vadas at one counter. You can get either two vadas or two idlis and one vada for Rs 15 (vadas being rated costlier than idlis). An employee who didn't know this logic, asked for three vadas. The person serving at the counter politely explained the rules to him. There is no excuse for the rudeness shown by the employee to a man simply doing his job. And surely this employee is "highly educated". No doubt, these are everyday things which are visible in all walks of life. No doubt, education is highly useful. After all, it helps to stamp down on others who haven't been so fortunate and then gloat in pleasure. Recently, I got into a conversation with an aged cab driver of my office. The conversation motored along (as did the cab) usual lines of where do you stay, what hours etc... Then I asked him what his children did .. It was really heart-warming to hear him describe their jobs, decisions etc.. with enormous pride in his voice..